This adapter allows you to use aftermarket amplifiers and speakers in conjunction with your Polaris Ride Command®. The PRCAA is designed to work with Polaris Ride Command® source units. 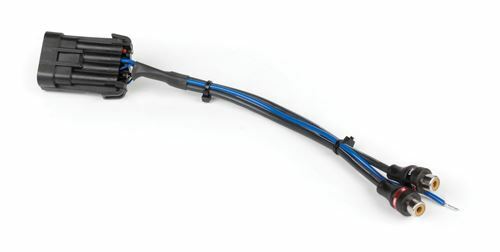 The factory style, multi-pin harness connects directly to the third output on the back of the Ride Command® unit. The opposite end features RCA full range output that can be connected to RCA interconnects and then to an aftermarket amplifier. This enables you to use the Ride Command® as your source while enabling you to output the sound to aftermarket amplifiers and speakers to get better sound. NOTE: With the increased popularity of adding audio systems to Polaris UTV vehicles, you may find yourself having issues when integrating into the RIDECOMMAND® systems.While there isn't likely anything wrong with the equipment you are adding to the vehicle, there may be an issue with the interaction between the RIDECOMMAND® system and the aftermarket products. Where one amplifier or sound bar may work fine another may have issues including diminished or distorted output or no output after cycling the vehicle's engine and having to reset the RIDECOMMAND® to restore output function. The RIDECOMMAND® system has a narrow "safe" range with regards to the impedance matching of the added aftermarket equipment. If the input sensitivity of the aftermarket equipment falls outside the RIDECOMMAND®'s "safe" range, problems may occur. MTX is currently working on potential solutions to overcome these issues and will continue to post updates as things change.